An IP address is a unique code or name of a device that separates it from another and allows it to communicate with other devices. The address is as unique as a mail address, Social Security number or Identity Card number used in various countries for different individuals. They are unique device identifiers meaning that your phone, tablet, and laptop all have different IP addresses and locations thus allowing other devices to know where to deliver information. But for two IP address to communicate, they need to be linked via a Transmission Control Protocol (TCP) which establishes a connection between the two to maintain a conversation. Internet Protocol version four (IPv4) is the fourth revision of IP which was created in 1970 using a 32-bit addressing system with four parts of 8-bits separated by a full stop/period. IPv4 was rolled out at a time when no one anticipated such widespread use of the internet that the finite number of IPv4 addresses - about 4.29 billion IP addresses - would end so soon. addresses in February 2011 while supplies continued to dwindle all over the world. Although not all were actually in use, they were legally owned by companies like IBM and therefore not free for use unless traded by the companies that own them. But as uptake of the internet, and the internet of things, increased in the 1990s, developers foresaw this problem and begun designing IPv6 or IPng (Internet Protocol next generation) to ensure the availability of new addresses upon the exhaustion of IPv4 IP addresses. IPv6 stands for Internet Protocol version 6 which is the replacement of IPV4. It is a 128-bit hexadecimal IP address system represented by 8, 16-bit parts divided by colons. While the sixth modification of IP addresses provides similar services, it provides a seemingly infinite number of IP addresses (because it operates on 128 bits) therefore correcting one of the significant issues with IPv4. 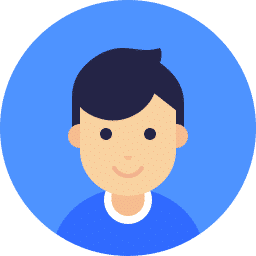 Because the addresses are infinite, they are very long but IPv6 addresses, specifically those with placeholder zeros, can be shortened by suppressing the zeros. Therefore, the IP address 2041: 0000:140F: 0000: 0000: 0000:875B:131B can become 2041: 0000:140F::875B:131B. 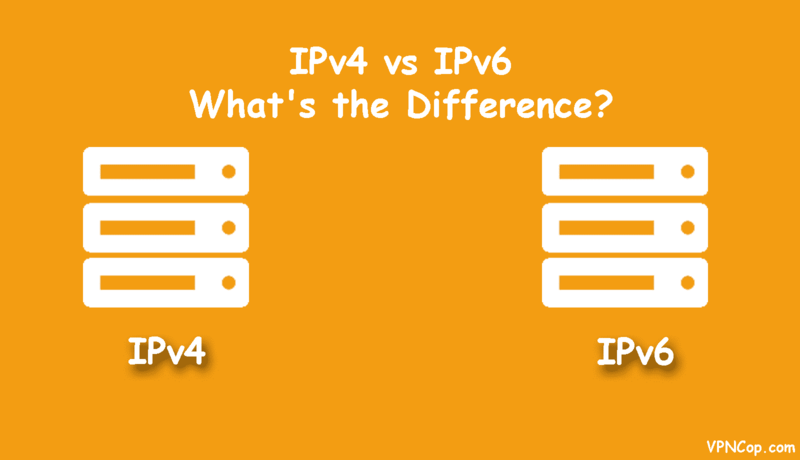 So, What exactly is the difference between IPv4 and IPv6? So many websites have tried to explain the many differences between IPV4 and IPv6, but their explanations are riddled with so much tech jargon that most readers fail to understand them. As is our practice, we simplify it all as we explain the key differences, the advantages and disadvantages and the relationship between IPv6 and VPN, which is our domain. 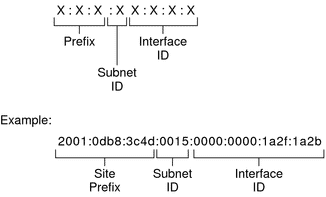 IPv4 uses 32 bit numeric address while IPv6 uses 128 bit hexadecimal IP address. 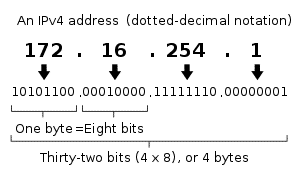 32-bit IP addresses are written in decimal and separated by periods to appear as follows: 11.16.227.240. On the other hand, IPv6 is long, and due to the immense number of addresses, they are represented in hexadecimal which is separated by colons. IPv4 addresses were eventually depleted as the internet grew because it could only accommodate 2*32 bit addresses, adding up to roughly 4.29 billion. IPv6 utilizes 128-bit address meaning that they can accommodate 2*128 bits addresses (which are a lot) and more than enough to address our current and future needs for a long, long time. IPv4 clients establish addresses every time they log onto the network using the Dynamic Host Configuration Protocol (DHCP) while IPv6 supports a better version of this protocol known as DHCPv6 that supports auto-configuration allowing their clients to “plug-and-play.” This means that devices can derive their IP addresses as soon as the switched on (plugged). IPv6 provides inbuilt protection for authentication and encryption while IPv4 requires security because it was initially built for a single military network, not for public use, and when its use became public, security features were added on but remained mostly unused by the majority of the public. The replacement of the Address Resolution Protocol (ARP) used in IPv4 is replaced in IPv6 with the Neighbor Discovery Protocol (NDP) because ARP has significant security vulnerabilities. Also, IPv6 does not require ARP because a Layer Two (L2) address can directly derive the interface identifier (ID) of a Layer Three (L3) address and therefore allow for communication across the IPv6 network. While Broadcast messages are available in IPv4, this is not the case in IPv6 where multicast IPv6 address FF02::1 does the same function. Increased security is a great benefit of IPv6 because authentication and end-to-end encryption of individual data packets are inbuilt into IPv6 making devices safer against cyber-attacks. Although this service was available on IPv4, it was optional, rather than embedded, so most people who are not tech-savvy end up not using it. Increased scalability and connect-ability of the Internet of Things (IoT) which is anticipated to rise to 25 billion ‘things’ connected to the internet by 2020. An infinite number of IP addresses will be required for this connection, but the improved security in IPv6 is also vital for IoT application, e.g. in smart houses and banking. Other advantages of IPv6 over IPv4 is that there will be no more private address collisions as was the case with IPv4, improved multicast routing allowing for more efficient routing and the use of IPv6 has potential to improve the internet by increasing its scale. Making a whole switch to IPv6 means that you will only access the IPv6 supported website. It is therefore advisable to use IPv6 applications that operate on dual-stack to enable you to access both IPv4 and IPv6 websites. While Microsoft has been on the forefront in the adoption of IPv6, Windows does not fully support IPv6 because to it; colons reference drive letters. However, Microsoft works around this problem by allowing for the replacement of colons in the IPv6 addresses with dashes. Conversion from IPv4 to IPv6 is slow for service providers but also for consumers who will eventually have to replace IPv4 supported equipment because it has no direct access to newly generated IPv6 equipment, websites, etc. Virtual Private Network (VPN) is a network that is designed to extend a user’s privacy across a public network. VPN has been described as an encryption tunnel between two or more devices used to protect an IP address from identification, encrypt communication, secure against surveillance and censorship as well as a host of other advantages. So how exactly does a VPN protect your and your data? Every time you access the internet, it records and monitors your usage, activity and the data you send. So what a VPN does is that it authenticates your data, encrypts and tunnels your data to make sure it stays safe. This means that your real IP address will remain protected and you will appear to have the one provided by the VPN service provider. Further, because tunneling results in the hiding of your location, a traceback will reveal the information as coming from the VPN service and encryption means that even if hacking occurs, your information is safe because it cannot be decoded. 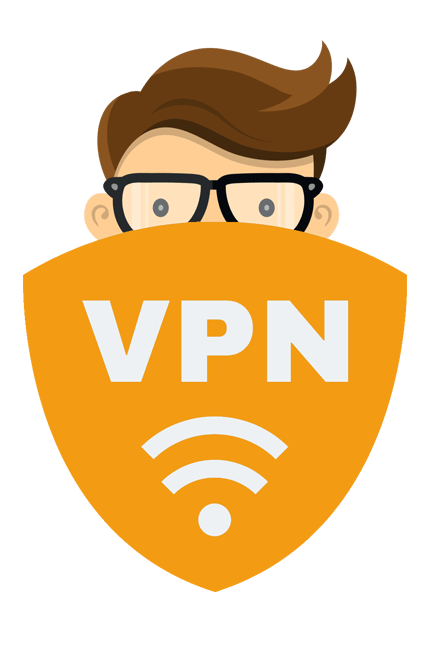 Due to the inadequate protection provided by IPv4, it was paramount that individuals and companies especially, use VPN networks to protect themselves and their data from hacking, malware and other insecurities provided by accessing the internet. While IPv6 is most definitely safer than its predecessor, it does not provide its users all the benefits enjoyed by VPN networks. For example, while IPv6 gives data encryption, it does not provide tunneling services meaning that any information you give can eventually, and quite quickly, be tracked back to you. However, because it does provide authentication services, your actual IP address and location is not readily visible, but it is not as safe as it would be if a VPN protected it. It is therefore still crucial that an IPv6 user secures their information with VPN services, but he/she need to be extremely careful about the VPN they choose. Some VPNs have been linked to leaks of their clients real IP addresses so be keen to evaluate the VPNs server network and if you can, run a DNS leak test. To date, IPv6 has been around for years, and since the use of IPv4 is still ongoing, there has not been a great shift from one to the other. As it stands, most devices are still using IPvT. Service providers have mostly launched devices and services that support the use of both IPv4 and IPv6 although some only support IPv6. Further, because the transition from IPv4 to IPv6 is gradual and not immediate, IPv6 can tunnel across IPv4 from compatibility. IPv4 compatible IPv6 addresses (0000: 0000: 0000: 0000: 0000:206.123.31.2) which has an automatic tunnel to carry IPv6 packets over IPv4 networks. IPv6 mapped IPv6 addresses (0000: 0000: 0000: 0000: 0000:FFFF:206.123.31.2) which are used on local nodes only. Although the cost of transition is relatively minimal to consumers, the process is slow because it is an expensive affair for service providers. These costs include updating all noncompatible network devices, routers, and software as well as the opportunity cost of spending time and money on this as opposed to other income-generating projects. As usual, businesses are slow to adopt new technology when it is not forced upon them or when the advantages are not immediate. So the adoption of IPv6 will only be 100% complete when the internet no longer accommodates or uses IPv4 addresses. Until this happens, or the situation is forced upon us, businesses will not willingly incur the cost that will facilitate the complete transition. IPv4 is here for a while yet, but eventually, we may be forced by circumstances to move to IPv6. So, while it may not, however, pay to completely use IPv6 due to the limited number of sites that use IPv6, it may pay to start asking your service providers if your devices are IPv6 compatible. Still, we all acknowledge that while the widespread use of IPv6 is inevitable, it is still far away from today so we should all take the opportunity to familiarize ourselves with the impact the evolution will have on us as service providers and users, so we are well prepared for it when it does happen. And while the differences between the two versions are significant, the greatest ones is positive and a big gain to us including the infinite number of IP addresses, and increased security. But while security is largely improved in IPv6, it does not negate the need for a Virtual Protection Network (VPN). A VPN will provide you with additional security services such as tunneling, in addition to authentication and encryption but you need to be extremely careful about the VPN you choose. 2.1 So, What exactly is the difference between IPv4 and IPv6? 4.1 So how exactly does a VPN protect your and your data?